I was looking for a little diversion while visiting my family in Southern Utah this summer. 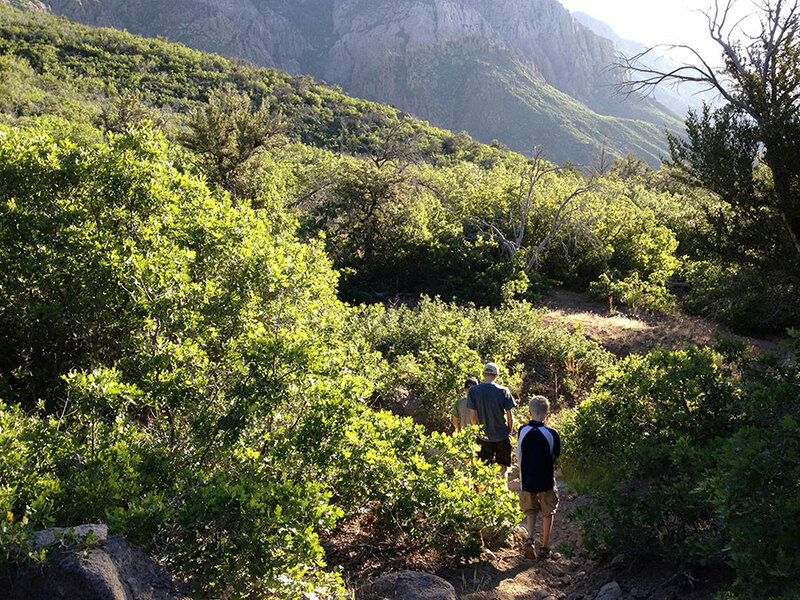 On a whim, we picked the Oak Grove Trail in the Pine Valley Mountain Wilderness, a scenic trail that climbs the East face of Pine Valley Mountain with views into Zion National Park and beyond[1. This trail continues up the mountain to the Summit Peak, which offers unparalleled views into Zion and the entire region]. We wanted a quick S24O trip close to town to get in a little backpacking and to escape the 100-degree heat (The temperatures in June were in the 80s°F (~27°C) during the day and dipped in the upper 50s°F (10s°C) at night). 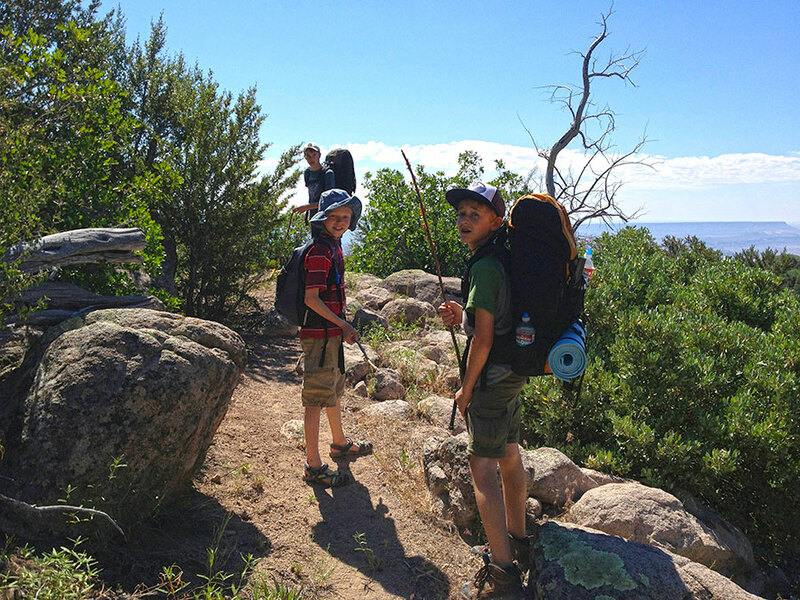 Our motley crew included my son, nephews, and my amazing backpacking mother. 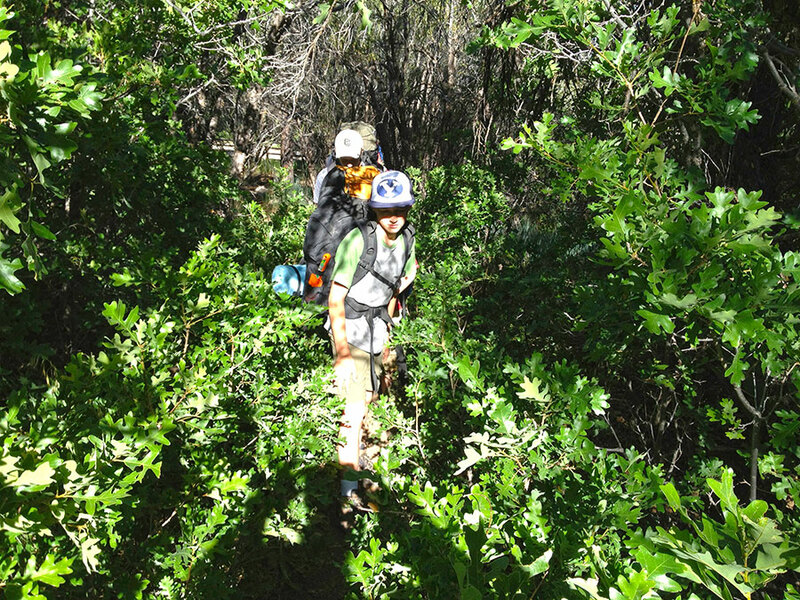 The trail itself was a nightmare: nearly overgrown with gamble oak and other scrub plants made progress slow, and made us wish for a machete or an earth mover. In places, we might as well have been bushwhacking, slowing our progress as we “swam” through the bramble. Either this was a little-used trail, or in desperate need of maintenance. Regardless, we hiked in only a few miles before we had to make camp for the night as daylight was diminishing. Places to pitch a tent were nearly non-existent due to all the bramble, and finding sturdy trees for hammocks were equally sparse. Most of the mountainside was filled with stubby gamble oak and other scrub plants with a lone juniper or pine tree scattered here and there. 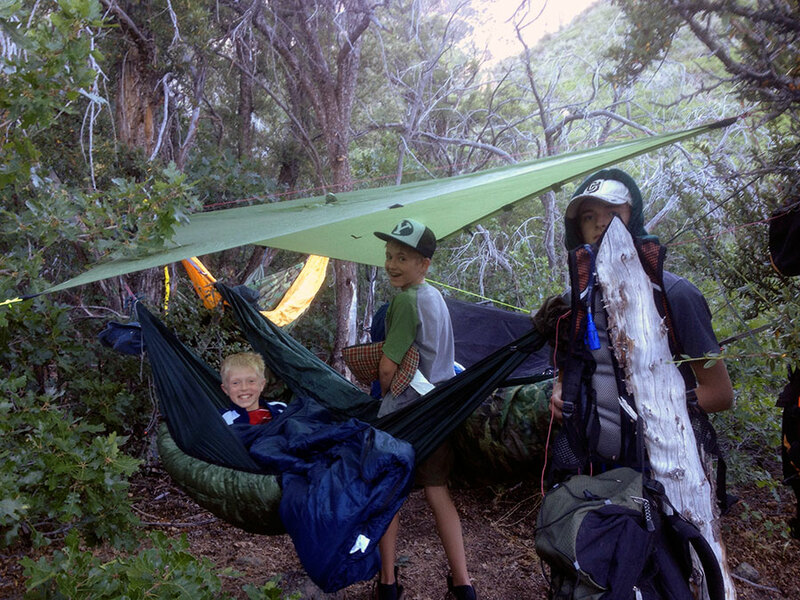 We lucked out and found a small patch of junipers where we were able to hang five hammocks in close proximity. On this trip, I brought along the Warbonnet Ridgerunner, a bridge hammock with a double layer bottom. The Ridgerunner has a longer-than-typical hang distance compared with the gathered end hammocks everyone else in my group brought, but thankfully the copse of junipers worked out perfectly. I used a short pad on this trip, tucked between the layers on the hammock for bottom insulation. This is one of the great things about bridge hammocks that appeals to me: the ability to hold a pad securely in place, all night. Having the zippered bug net was also a huge plus, giving me a bug-free enclosure where I could write in my journal and read before going to bed. Bridge hammocks, such as the Ridgerunner, have such a great, flat lay that nestling down to bed feels as natural as being tucked in at home. Bliss. The camp made for a cozy cluster, which was a lot of fun for nearly everyone (mom admitted later she wished she had ear plugs). In the morning, after breakfast and breaking camp, we hiked a few miles further to creek where we refilled our water. Further down the trail, but not far from the creek, was an excellent hammock camping location. 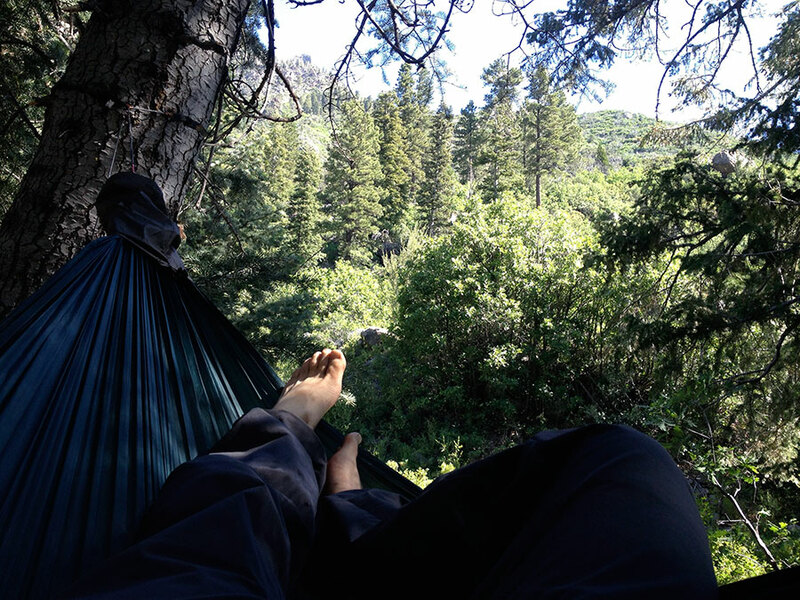 Being on the north face of a spur, tall pines grew abundantly and we opted for a quick lounge in our hammocks, plotting with ourselves to hike to this spot next time we found ourselves looking for a quick overnight escape. This was a great trail and a beautiful escape from the heat of Southern Utah. I’m hoping for a repeat trip next year, with a possible summit attempt on Pine Valley Mountain. Utah’s state flower, the Sego Lily, was abundant on this trail. Another great trip report. Thanks for sharing these as a nice variety among the gear reviews, how-to’s, etc.